I'll add resources here (and format text etc) on this over time. This is the type of thing you need to research and analyse: the movie was partly funded by government grants (National Lottery payments through the BFI) - not loans, grants - and is available to stream through platforms such as BFI Player (which is highly selective). This is the guidance the exam board have given to you on this CSP, which is focused on Key Concept INDUSTRY only. In common with many Indie productions, there is no quoted budget to be found online. However, the cinematographer notes they saved £150k by filming digitally for the 1st time; there was a £300k FilmFund (BFI, funded by the UK government/National Lottery) grant and another €100k grant from Creative Europe, as well as tax breaks for filming in Britain and Belgium (as a UK, France, Belgium co-production!). Shane Meadows' 2006 social realist This is England cost Warp Films £1.5m, while Ken Loach's 2009 Looking for Eric was £4m and the 1920s war drama The Wind That Shakes the Barley a similar €6.5m. Students need to know that in terms of actual production budget IDB costs were low, particularly in relation to Dr Strange. development, production, talent and skills. office of the director’s career and winning the BAFTA for Outstanding British Film. 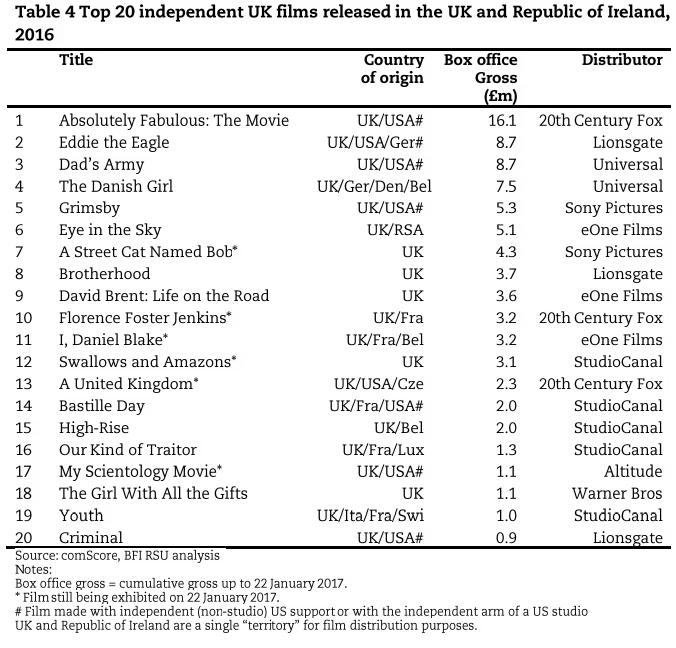 IDB was on the top 20 Indie list of the year ... but managed just 5% of the actual #1 (Rogue One), or about 15% of Dr Strange's UK take! It won the Palme d’Or in Cannes, comes from a beloved British auteur and has garnered critical acclaim, but would Ken Loach’s I, Daniel Blake prove too tough a sell for cinema audiences? If UK distributor eOne had any qualms, they have surely evaporated now that I, Daniel Blake has opened with an impressive £404,000 from 94 cinemas, and £445,000 including previews. Stripping out the previews, site average is a very robust £4,298. We don’t know exactly how rich — Ken is uncharacteristically discreet on this point. But we do know where a lot of the money that funds his films comes from. Over the course of his 50-year career, there has been a steady trickle of public-sector grants for his agitprop. ... The BFI is government-funded and distributes Lottery cash. After all, if it weren’t for the EU, Sixteen Films wouldn’t have received a grant of £172,828 from Creative Europe, a quango funded by Brussels. That grant was divided between I, Daniel Blake and The Flickering Flame. The latter is ‘an interactive documentary’ that explores the ‘uncompromising films’ of one Kenneth Charles Loach. ... Incidentally, one of the funders of the new film was BBC Films, whose head, Christine Langan, says she is ‘honoured’ by the association. Financing an arthouse film is as tough as ever, but O’Brien learned at an earlier stage that European co-productions were a key component in launching a Loach film. France is the biggest box-office market for the director’s work, and so finding partners in that country is a logical starting point, and can provide the foundations on which the rest of the financing is built. “I, Daniel Blake” was co-produced by Pascal Caucheteux and Gregoire Sorlat at Why Not Prods. and Vincent Maraval at Wild Bunch, the film’s international sales agent. The French distributor is Le Pacte. With backing from France in place, raising funding from the U.K. becomes much easier, and additional financing can be sought elsewhere in Europe. The British Film Institute and BBC Films both supported “I, Daniel Blake,” and the production also benefited from the U.K. tax credit. Jean-Pierre and Luc Dardenne’s Les Films du Fleuve in Belgium came on board as a co-producer, and Cineart took Belgian distribution rights. Support also came from French pay-TV company Canal Plus, Gallic free-to-air broadcaster France Televisions, Belgian teleco VOO and Belgian television operator Be tv. “All of that adds up to a decent amount to put into the budget,” with the risk spread around, O’Brien says. A combination of an increasingly risk-averse Hollywood movie system addicted to blockbuster franchises and the global explosion in mega-budget TV drama is putting the squeeze on smaller films. Cannes prize-winners are among the few lower-cost productions that are guaranteed a berth in the modern cinema market. The UK is a sombre case study for the mid-to-low-budget film industry. The number of domestic UK films costing from £500,000 to about £30m to make, such as T2: Trainspotting and Florence Foster Jenkins, fell from 77 to 60 between 2014 and 2015. This is the lowest number made since 2006, according to annual figures published by the British Film Institute (BFI). 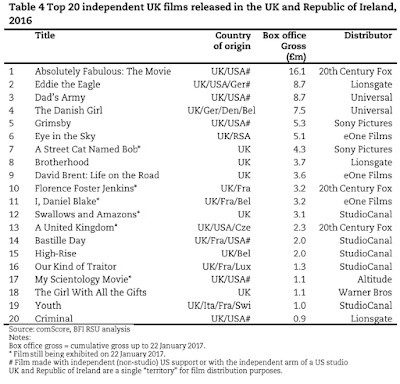 The number of small to mid-sized budget co-productions, funded by mostly European producers, such as the Oscar-winning The Lobster, and I, Daniel Blake, fell from 37 to 30 – a level not seen since 2008. As well as the changing focus of the film industry, pressure is being ramped up by the boom in big-budget drama flooding TV, typified by shows such as Netflix’s £100m co-production The Crown. In the US the number of scripted shows being made annually has more than doubled since 2010 to more than 500 this year; Netflix recently revealed it has 90 original productions under way in Europe alone – Sky has 80 – and traditional broadcasters such as ITV and the BBC have upped their game with huge hits such as Broadchurch and Line of Duty. The BFI says the figure for inward production investment in TV, mostly from US companies such as Amazon, Netflix and HBO, nearly doubled from £252m in 2013 to a record of almost £500m last year. This boost has been in part fuelled by a film industry style tax break for glossy shows costing at least £1m an episode to make which was introduced in 2013. By contrast, the spend on UK domestic films dropped to £198m in 2015, the lowest level since 2007. The lure of pots of money, and the overlap of skills, related to glossy drama has drawn many of the UK’s well-known film production companies to expand into the sector. Working Title, arguably Britain’s best-known film producer, Ridley Scott’s Scott Free and Heyday – producer of the Harry Potter films, the Paddington films and Gravity – have all launched TV divisions in the last few years. However, last week Entertainment One, distributor of films including La La Land, Arrival and Luc Besson’s forthcoming $180m Valerian and the City of a Thousand Planets, said it was getting out of small-budget films. Following a similar model to the Hollywood majors, the Canadian media group said that its film strategy will now focus on “producing and sourcing a reduced slate of premium films”. [31 October 2016] I, Daniel Blake continued its powerful emotional impact with an insignificant drop in its 2nd weekend. Audiences responses have been in incredible. We - MA Curation student Dave-Taylor Matthews and I - wondered if Loach could have the same impact today as his Cathy Come Home did in the 60s which was watched by a quarter of the population on TV. I, Daniel Blake certainly seems to be generating a national conversation with plenty of press/social media and Ken appearing on Question Time. Credit must go to Eone who have positioned the film brilliantly and also released it on just the right scale, increasing prints in week 2. Dave had organised a Cinema of Dissent season around I, Daniel Blake picking up on Loach’s Cannes speech. The season included Leviathan, Taxi Tehran, Cathy Come Home and a talk by Cathy Come Home producer Tony Garnett which all individually attracted 80 plus admissions and helped build on the debate generated by I, Daniel Blake. Elsewhere at Watershed it’s been one of the quieter autumn weekends: I, Daniel Blake and Nocturnal Animals were the highest performing but they are definitely winding up in their 5th and 4th weeks. [23rd November] Elsewhere at Watershed it’s been one of the quieter autumn weekends: I, Daniel Blake and Nocturnal Animals were the highest performing but they are definitely winding up in their 5th and 4th weeks.